Christmas is always being part of humans’ life; it’s full of meaning and excitement to all children, more basically. As they say, Christmas is originally and intended for children (in respect to what Jesus was). But obviously, it’s for everybody regardless of social, personal and family standing a person may be. It’s for everyone’s felicity upon celebrating the so called – Birth of Jesus Christ. But what is more important here is that, Christmas is for humanity to get together and acknowledge the true essence of love, sharing, forgiveness and family life. Celebrating such occasion is quite in numerous ways according to the customary of whichever country an individual is in. 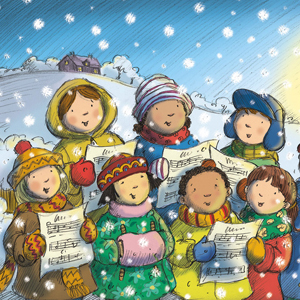 Though, there are copious of ways in expressing the happiness in Christmas season, there’s always one thing which connect every body in one – The Christmas caroling. In Africa, everyone must prepare for their love offering for Jesus before joining the service, have their dinner prepared and does also the universal trend of caroling around the city or anywhere in the place. Alaska also does have Christmas caroling around the place by the children. They will sing the song ‘Christ is Born‘ and everybody will in unison to say the finale words ‘ God grant you many years’. 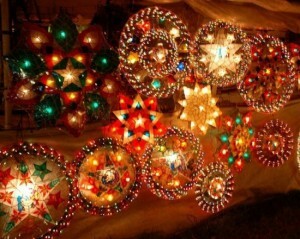 In Brazil, they almost have the same Christmas customary as Philippines have. 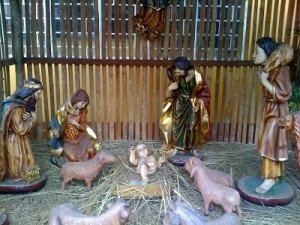 They go to church for masses (Catholics), they termed this as ‘Missa De Gallo‘ or ‘Simbang Gabi‘ for must Filipinos do. 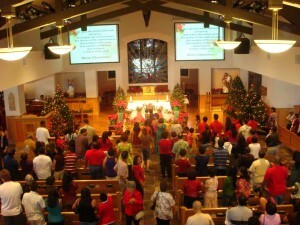 People will go to church too early morning as 4:00 or 5:00 A.M. people differ in their ways of celebrating Christmas following their varying ways of expressing love and solidarity with their love ones. But what links them all? It’s their way of singing and praising to Jesus during the season. They all have the same action and message for thanksgiving and offering to Him. Though, each has uttered it in different way and language, still the great message is the same with the others.However, celebrating Christmas has also to deal with the different dialects or languages (might be mother-tongue or the other language). Anywhere, we could see many people coming foreign countries visiting or rather staying Christmas season in our country. They may tend to enjoy the stay while acquainting with some of our countrymen. The least I could point as proof is my employer before. One of their offspring had married a foreigner. Eight years ago, he came visited the Philippines and stayed in the house where I worked. He was well-discipline and courteous. He stayed there until the end of Christmas season. While staying there, he did socialize with us and even to me. He is a Dutch, and it was so hard for me to converse with him. When he asked me, I had couple of minutes to comprehend if he won’t accompany his utterances with sign language. And it’s absolutely- Funny! But there was one thing I do understand well when he left the house, when he said ‘ I’m happy staying here with so kind people like you ‘Ste—p—hanie‘. Yes! He said that in English with smile yet stressing my name in broken way. As what the majority could tell, though, our traditions and social behavior are seemed to be so far apart and so different from each other, still, Christmas could easily bind us together in terms of its way of expressing and mainly, its language. Let’s say for instance some of your kinship would bring someone or people as visitors here in the Philippines in your household. They might be French, American or British. Of course, there would be number/s of languages then to be dealt with, right? Therefore, as hosts, you must learn or and be ready to welcome them warmly and in open hand. Language then could be the prime problem that had to be taken into consideration. Though it’s Christmas, everybody must be considerate, humble and full of perseverance to learn and to interact even to strange people to you. Often times, i do hear people now a days are having chances to be more intimately attached with foreign people as well as with there culture as a whole. Let me cite an example. Some of my kinship is now married with Australian nationals. They are good fellows and had proven their good relationship with their off springs. Before, during the early stage of their marriage, they had hard time adopting each other’s differences in language, customaries, and most of all, principles in life. My kin are speaking Filipino and their husbands are speaking differently. Though, at all ends of their conversation, they did understand each other’s idea through sign language and numbers of explanation. The great thing I do admire of those foreign people is that, every Christmas, they never forget to celebrate it with full of excitement, dedication, show and share whatever blessings and happiness they have to all of us. They were the one who even initiated how to put Christmas decorations, plans whatever recipe and foods to prepare, giving gifts and in praising the Almighty. It’s really satisfying to have these kinds of people; considering the fact that they are not purely born in our mother land with our own way of living, but still, in Christmas, and through Christmas, we and they are getting in one in one Language – CHRISTMAS.